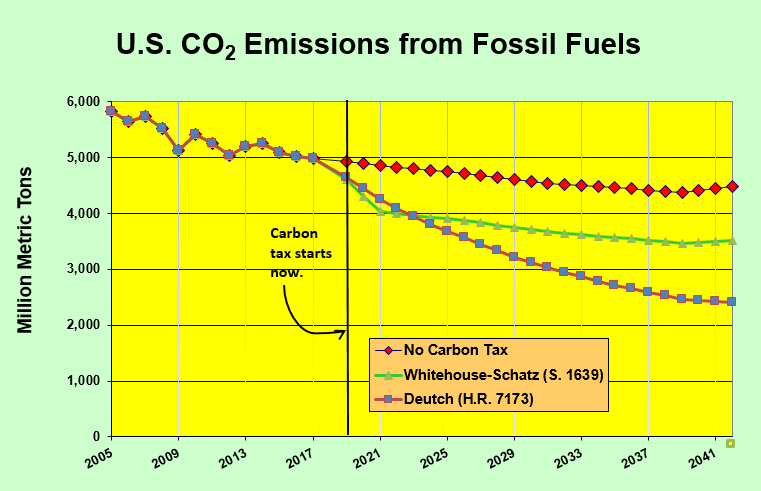 Given that “the chances of any carbon tax bill passing in the next Congressional session are close to nil,” then “the best bill is the one that can pass”…26 (at least!) months from now! In the current wrecking ball mode of US politics, 26 months is a long time…to -for instance- compare, point by point, what might remain two leading legislative possibilities, as discussed here: HR 7173 versus HR 4209. On the further assumption that the dominant political offerings in Nov. 2020 will be something like a quasi-Trump elephant and a neo-Clinton/Obama donkey, such potentially improved chances for national carbon taxation two years hence would appear to be contingent upon a donkey sweep of both houses of Congress and the White House in the next general election. Ergo, it would seem to make sense in the meantime to look into how to protect HR 4209, or some later ‘New Green Deal’ (or whatever other specific proposal might emerge over the next 2 years as the leading “contender for a Democratic climate program”), from overburdening with special interest pork, and to consider ways of solidifying and strengthening any (potential) carbon tax element within such a bill. Such crystal ball gazing aside, this is an excellent and welcome synopsis of a timely new development. If “The better Democratic proposal would see a smaller reduction of 25%.” why is it the better bill? I love that you know the carbon tax is the way to go but your predictions aren’t reliable. You sell the future short and under represent human potential. You should be looking for how to promote the new bill and helping build public awareness. It’s not better than the Deutch bill. It’s better than any of the bills with only Democratic support (and much better than the Curbelo bill). I’ve tweaked the wording to clarify. Sorry for the confusion. I remember in the mid-1970s when the experts said we would need a nuclear power plant every 5 miles along the California coast to meet the demand for electricity. Instead, we chose a different course and pursued it with great vigor. We flattened demand through efficiency and gradually replaced fossil power with clean power. I remember, not so many years ago, when getting Republicans to even acknowledge climate, much less support a strong price on carbon, was impossible. Citizens’ Climate Lobby built a national movement to challenge that, and with exponential growth of membership and citizen lobbying has begun to bend the curve, to what you see in this bill. With support from the increasingly alarmed and climate-engaged business community, and recurring slaps from climate-aggravated natural disasters, we can bend the political political curve around to a veto-proof majority in both Houses. And bend the emissions curve down in time to save the world we love. Why not try? Contact http://www.BusinessClimateLeaders.org.